Bixler’s Hypalon inflatable boat and raft repair kit includes 8 oz of ToobSeal repair sealant, Hypalon adhesive, 6″ x 12″ Hypalon, Toluene, brushes, sandpaper and a cooler bag. Available colors are black, blue, dark gray, light gray, red, white and yellow. The only repair kit available with all the materials required to do your own repair as well as enough ToobSeal liquid interior sealant to repair one air chamber of your inflatable boat or raft. Suitable for all Hypalon boats including: AB, Achilles, Avon, Caribe, Nautica, Novurania, TUG, Walker Bay and all other Hypalon inflatables. Our repair kits are rotated quickly and stored in an air-conditioned and heated facility in order to guarantee freshness and effectiveness! 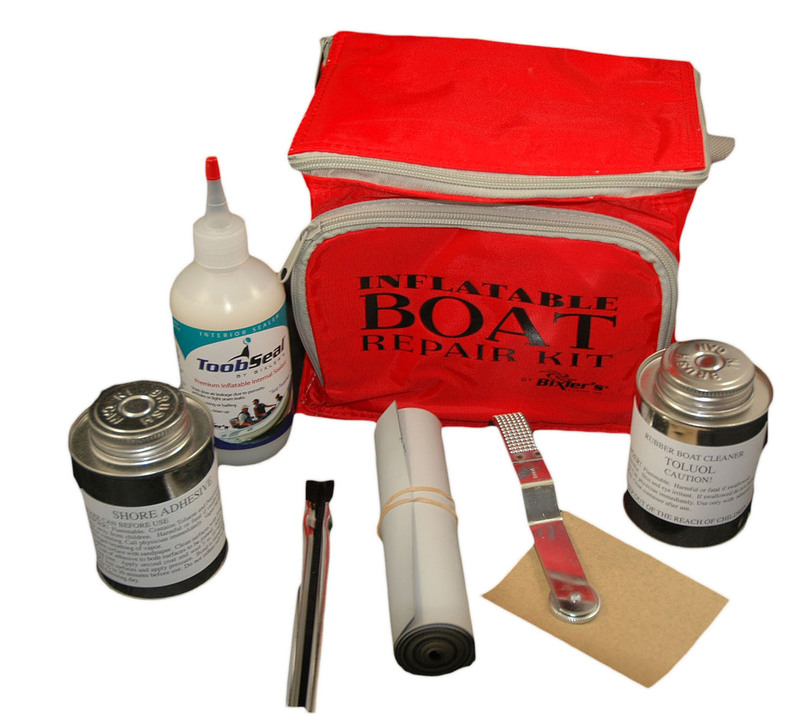 The Inflatable boat and raft repair kit including 8oz of ToobSeal® liquid sealant which is the only repair kit available with all the materials required to do your own repair as well as enough Toobseal® liquid interior sealant to repair and seal one air chamber of your boat. Our kits can repair Hypalon or Neoprene inflatable boats or rafts using a tough bonding formula. Kit includes 4 oz Tolutol cleaning solvent and 6″ x 12″ heavy reinforced 1100 denier Hypalon fabric to assure long lasting repairs on dinghies, sport boats and other inflatable craft. Kit also includes 4oz Shore Hypalon adhesive, roller rasp, brushes, sand paper,and instructions.. Packaged in a red nylon cooler bag. Quart size ToobSeal and additional fabrics and glues listed in related products below. Suitable for all Hypalon boats including: AB, Achilles, Avon, Caribe, Nautica, Novurania, TUG, Walker Bay and all other Hypalon inflatables. Available in black, blue, dark gray, light gray, red, white and yellow. We cannot ship Repair Kits via air freight or Priority Mail because they contain adhesives which are hazardous materials. If you choose the Priority Mail option during check out, we will ship via Parcel Select Hazmat service which may take some extra time. We recommend you choose the UPS option at check out. We cannot ship repair kits internationally. Since we cannot ship glues to Canada, Canadian customers can call Dan’s Nautical Shop at (519) 735-2628 or e mail Dan at Dansnautical@gmail.com. The repair needs to be done indoors in a low humidity environment. Clean the boat in order to prevent dust and dirt from getting on the tacky glue. Carefully, clean old glue off of repair area using a small amount of supplied Toluene Or Orange-Off Inflatable Boat Cleaner and Adhesive Remover on a lint free cloth. Always wear gloves when using glues and solvents. If you have used Armorall or other silicone based cleaning products, our adhesive as well as any and all inflatable boat glues will have difficulty bonding. Extra cleaning may help. Make sure patch is roughly 2” larger than damaged area and cut with rounded corners. Mark perimeter of patch on boat with pencil then carefully put masking tape all around the pencil mark leaving roughly 1/8 “ around the pencil mark. The masking tape will protect the boat from accidental excess glue and/or MEK but you should still be very careful not to get the solvents outside the repair area. Roughen the penciled in area with supplied sandpaper being careful just to remove the top coating of Hypalon and not the fabric threads deeper down. Roughen the underside of the patch also. Wipe the boat as well as the patch with Toluene and allow to dry. This is a very important step as the surfaces must be completely cleaned of oils, cleaners and dust. Using the brush, apply a thin coat of adhesive to both surfaces and allow to dry roughly 15 – 20 minutes, or until glue is dry/slightly tacky to the touch (use your knuckle as there are less oils than your fingertip). Apply a second thin coat to both the patch and the boat and allow to dry for roughly 15 – 20 minutes again, make sure glue is dry/slightly tacky to the touch. Once the adhesive is tacky to the touch, using a blow dryer to reactivate the adhesive minimizes the complicating effects of humidity and air temperature. Warm both surfaces with a hairdryer. The surfaces are ready to join when they are warm. Join surfaces from the center of the patch out towards the edges so no air is trapped under the patch. Curving the patch so the center contacts the surface first and pressing firmly helps insure 100% adhesion. Bond is immediate. Use the supplied roller and roll the patch from the center towards the edge. Roll every centimeter of the patch as this will force air bubbles out as well as solidify the bond. Be careful not to allow the roller off the patch as it can mark the boat particularly when the boat has been softened with solvent, adhesive and heat. Allow 6 hours to dry. Low humidity atmosphere is the ideal condition. Do not inflate to full pressure for 12 hours. Can be used on any Hypalon inflatable boat, but is specific to AB, Caribe, Apex, Avon, Novurania, Nautica, TUG and Walker Bay inflatables. Orca Brand Available in Artic Gray (light gray), White, Navy, Black and Military Gray. Meter. Weaver Hypalon 2-part adhesive, 8 ounce, for gluing on rubber pads, adding lifting rings and making repairs to inflatables made from Hypalon material. Bixler's ToobSeal ® Interior Sealer, quart, stops slow seam leaks and porosity in both Hypalon and PVC inflatable boats using an extraordinary acrylic based formula. Buy 2 or more and save $2.00 each. Shore Adhesive is a powerful, easy to use, single-part contact cement, and when used correctly, will attach patches and accessories to all Hypalon, fiberglass, Kevlar, and aluminum boats. Available in 1/2 pint. Buy 4 or more and save $1.50 each. Repair your Hypalon or PVC Inflatable on the fly! Tear Aid Peel & Stick patch kit for Hypalon, Rubber or Canvas and PVC or Vinyl. ClamSeal Emergency Inflatable Boat and Life raft Repair Clamp. Fix Holes Instantly Without Glues. 5" PVC round patch for Inflatable Boat Repairs. Available in Gray or White. Achilles Inflatable Boat Hypalon Fabric, 1000 Denier, per Meter. Achilles Inflatable Boat Hypalon Fabric available in blue, white, dark gray, black, red, light gray. The Extra Large Hypalon inflatable boat repair kit comes with 2.5 feet of Hypalon fabric and is the only kit available that comes with 8 oz of ToobSeal® liquid interior sealant, enough to repair one air chamber of your boat. Suitable for these manufacturers: AB, Achilles, Avon, Caribe, Nautica, Novurania, TUG, Walker Bay and all other Hypalon inflatables. Methyl Ethyl Ketone (MEK) Cleaning Solvent, 1/4 pint (4 oz). To remove old glues off of PVC boats and to prep the surface when installing patches. Toluol Cleaning Solvent, 1/4 pint. For Hypalon boats. Inflatable Boat Hypalon Fabric, 800 denier. available dark gray.